One year ago today, I decided to finally start blogging. I'd been thinking about it for months, and finally decided to just go ahead and do it. I figured it would be fun, even though I wasn't sure anyone would ever read it. Twelve months and almost 100,000 page views later, it's still fun. And I'm still trying to figure out who exactly is reading (but hello to all of you in Malaysia, where apparently I'm huge). Feb. 8, 2008 - The Leafs are terrible, but at least they just beat the Habs. DGB makes an understated debut with a short game recap of the Leafs win over Montreal. It takes exactly one paragraph to get to the first "Kyle Wellwood is fat" jokes. Feb. 9, 2009 - One day into the blog's history, we get the first of roughly three dozen posts to feature the Stu Grimson video. Feb. 12, 2008 - The first "Obscure Moments" feature, with an in-depth breakdown of the Ron MacLean-Nik Borchevsky interview. Readers begin to wonder if maybe I have too much time on my hands. Feb. 20, 2008 - The infamous Russ Courtnall for John Kordic was a good trade post. This post has become the #1 Google result for most combinations of Kordic and Courtnall's name, and still drives hundreds of visitors to the site, none of whom agree with me. Feb. 24, 2008 - Two days before the trade deadline, Mats Sundin announces he won't waive his no-trade clause. I begin writing anti-Sundin posts, a temporary phase that readers assume I'll grow out of quickly. March 6, 2008 - I make the argument that the Leafs are the softest team in the NHL. Somewhere, Brian Burke nods sadly. March 26, 2008 - Thanks to Patrick Roy's lunatic son, I write what still stands as the most popular post in DGB history: How To Fight When You Don't Want to Fight. April, 2008 - Inspired by Mark Bell murdering Daniel Alfredsson, April somehow becomes Beat Up The Senators month. We have some fun at the expense of shameless Sen homers Bruce Garrioch and Don Brennan, and then point out that the Senators steal everyone's playoff traditions. And then, rock bottom for Sens fans: this happens. May 6, 2008 - Stung by accusations of being too negative, I try to come up with 20 good things about the 07-08 Leafs. For some reason, commenters accuse me of being insincere. May 26, 2008 - The second Great Obscure Moment - Everything that happened after the Clark/McSorley fight. Sadly, my quest to determine the identity of Pinky Finger remains unfulfilled. June 20, 2008 - June is a slow month, both for the Leafs and the blog. I do get a chance to make fun of The Love Guru, though. The post is read by hundreds of people, making it more popular than the movie. 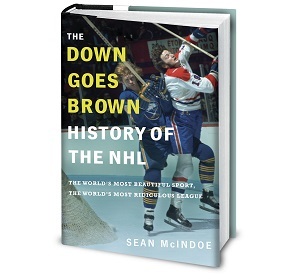 June 24 - Down Goes Brown wins Eklund's "Next Great Hockey Blogger" contest at hockeybuzz. July 1 - Free agent signing day. The Leafs sign unheralded defenceman Jeff Finger, who I know nothing about. I ask the folks at the (now defunct) Avs blog In The Cheap Seats to write a guest post about him. Puck Daddy links to it, and confused Leaf fans flood the site for the biggest single-day traffic in the blog's history, by far. That's right, my all-time biggest traffic spike was due to a post I didn't write. I think that tells you something. July 24 - DGB makes the New York Times, except they don't get the name quite right. July 29 - I set out to name the Worst Leafs of All-Time. This ends up being a three-part series, after I edit it down from its original 100,000 words. August 13 - I write a sympathetic post about how Mats Sundin should really wait until mid-season to return to the NHL, but clearly can't because he said he'd never be a rental and obviously he's a man of his word. Yeah. Keep your day job, Nostradamus. August 31 - I give Bryan McCabe a rousing send-off on his last day as a Maple Leaf. To be honest, I was just angry that the Leafs had parted with McCabe, Wellwood and Raycroft within a few weeks. In the first six months of this blog, 80% of the writing consisted of the same three jokes: Wellwood is fat, McCabe scores in his own net, and Raycroft has no glove hand. That was it. I was terrified that I'd have nothing to write about. September 14, 2008 - Spiralling into depression, I set out to answer the question: Is this the worse it's ever been? Spoiler alert: Yes. September 22, 2008 - EA Sports releases a commercial for NHL 09 that features Kyle Wellwood. I'm thrilled, because I get to use up all my leftover Wellwood jokes in one post. September 29, 2008 - Maple Leaf Media Cliche Bingo debuts. Fifteen seconds later, Damien Cox has filled in his card. October 15, 2008 - I count down the Top 10 tough guys from the old Norris Division. 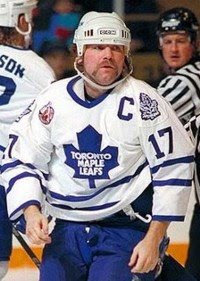 The list ends up being somewhat anti-climactic, since all ten spots are awarded to Wendel Clark's various knuckles. October 30, 2008 - Somebody who makes more money than him makes Howard Berger feel inadequate, so he takes out all his dashed aspirations on Leaf fans with a legendary post. November 3, 2008 - I start writing about Wendel Clark, and don't stop for three weeks. The Top 17 Wendel Moments series dominates the site for the rest of the month, covering goals, hits, fights and more. We even find out who made the All Heart video. November 19, 2008 - What's the difference between this blog and a hockey game in the southern US? This blog can sell out. December 16, 2008 - I post about my most-wanted Maple Leaf collectibles. The entire post is just a thinly-veiled excuse to make some Al Iafrate jokes. God I wish I had a blog in the early 90s. December 18, 2008 - Mats Sundin finally signs with the Canucks. I write a message to Mats, as well as an explanation of why Leaf fans are so mad at him. Somebody sends the link to Sundin, but it takes him two months to decide whether he wants to click on it. December 23, 2008 - I write a humorous holiday post about throwing a dog into a furnace. December 28, 2008 - I spend 15 minutes writing a post about who took out Matt Stajan, and three hours looking for angry soccer ball clipart on google. January 10, 2009 - I officially give up on the season. Judging by the comments section, most of you were already there. January 25, 2009 - I make a pro-fighting post, kicking off about two weeks straight of fighting debates on the site (including one with Damien Cox). Everyone pretends to be impressed by the depth of my research and the persuasiveness of my argument, while secretly wishing I'd just go back to making jokes about the 1990 Leafs. January 31, 2009 - I count down my personal top ten Doug Gilmour moments. While the old clips of goals and other highlights are fun, the post is most memorable for allowing me to finally create an "enrico ciccone" tag. February 8, 2009 - Down Goes Brown celebrates its one year anniversary. The Leafs are terrible, but at least they just beat the Habs. Thanks to everyone for reading and commenting. And a special thanks to those of you who've helped the blog grow by sending links to your friends and others who you think might enjoy it. My only regret is that I didn't get started sooner. So if you're somebody like me -- a Leaf fan who likes to watch, talk and write about hockey -- and you don't have your own blog, why not start one? If I can do it, believe me, so can you. Just stay away from Malaysia. That market is all mine. Just want to say how much I love the blog. I'm always reading. Great job thus far big guy. And the twitter account is gold. Congrats DGB! Thank you for introducing me to the Barilkosphere. I dont even remember how I found your site, but because of the links it introduced me to a whole new part of Leaf Nation. Thank you! Congrats from Malaysia. I'm with my family visiting my in-laws here. I'm keeping in touch with all things Leafs through your site, my window to the Barilkosphere. Look forward to reading more of your blog in the future. "Just stay away from Malaysia. That market is all mine." LOL! I posted my first comment before reading your whole post. The Malaysian market's all yours till mid-March, then I'm back in Canada, and Malaysia will once again drop off the map as far as Leafs fans go. Congratulations, DGB! Awesome stuff, all year long. Keep up the great work. Really appreciate your insight and your humour. Wait, Down Goes Brown has a blog now? As a celebration we should proliferate the web with photos of Cox's mullet of years gone by. Congrats on making it a year without any wrist-related "accidents"! Here's to many, many more with hopefully happier Leaf-related news to share! I wouldn't with that upon anybody. 'Grats DGB, you do good work and I don't thank you enough. Fun fact: I have seen The Love Guru, and I watched it the whole way through. I did not, however, pay money for it. You made it into a Brian Burke Tweet! Congrats DGB! I love this blog! Little late to the party, but DGB, merry blogiversary. Hope you got a plaque and ham to commemorate the occasion.